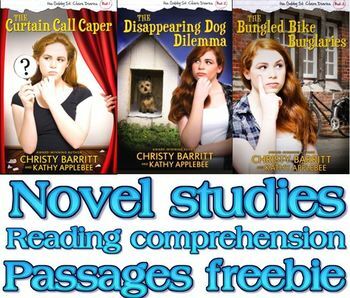 Three novel studies and sets of reading comprehension packets based on the Gabby St. Clair mystery novels by Christy Barritt and Kathy Applebee. Extend the learning for Curtain Call Caper, Disappearing Dog Dilemma and The Bungled Bike Burglary, all available on Amazon or Barnes and Noble. Each novel study includes 25+ pages of printable graphic organizers, plus .PDF and Power Point resources to teach vocabulary, figurative language, making inferences and predictions, discussion questions, journaling prompts, links to online games and quizzes plus a menu of projects related to the novels. This makes tiering and differentiation is a snap. Each reading comprehension/guided reading packet includes 6 to 11 printable passages and questions that span the scope of Bloom’s Taxonomy (recall, sequencing, explain, describe, comprehend, infer, estimate, predict, facts vs. opinion, compare and contrast, pros and cons, and figurative language.). Graphic organizers are included for vocabulary work and parts of speech. Passages should be read/used in order. Can be used for independent practice, guided reading, homework, or class work. More about Curtain Call Caper: Is a ghost haunting the Oceanside Middle School auditorium? What else could explain the disasters surrounding the school play—everything from missing scripts to a falling spotlight and damaged props? All seventh grader Gabby St. Claire has dreamed about is being a part of her school’s musical. But a series of unfortunate events threatens to shut down the whole production. While trying to track down the culprit and save her fifteen minutes of fame, she also has to manage impossible teachers, cliques, her dysfunctional family, and a secret she can’t even tell her best friend. Will Gabby figure out whom or what is sabotaging the show . . . or will it be curtains for her and the rest of the cast? More about the Disappearing Dog Dilemma: Why are dogs from all over town disappearing? Who could be taking them from their loving families? When two friends ask seventh grader Gabby S.t Claire for her help in finding their missing canines, Gabby decides to unleash her sleuthing skills to sniff out whoever's behind the act. But time management and relationships get tricky as worrisome weather, a part-time job, and a new crush interfere with Gabby’s investigation. Will her determination crack the case? Or will shadowy villains, a penchant for overcommitting, and even her own heart put her in the doghouse? The economic concepts of scarcity and opportunity cost are integrated throughout the novel.